You are currently browsing the tag archive for the ‘Rainforest’ tag. On 1st April I received an email message from Charlotte Krzanicki, Head of Dogsthorpe Junior School ‘I have a project for you to get your teeth into!’ It could have simply been an April Fool gag, but intrigued by the invitation I called her bluff and we arranged a date for a meeting later in the month. When I arrived at the school on the morning of 22nd April I found Charlotte in her office and was surprised and very pleased to find she had also invited fellow artist and chum Katie Smith along too. A few years ago we had seen each other quite regularly and got on very well, but then ‘Black Sunday’ intervened and we’ve not had the opportunity to work together since. If Katie was going to be involved, then I knew that whatever project Charlotte was about to propose it was going to be a winner. After a catch-up chat Charlotte took us for a walk around the school, passing through a long and very white hospital corridor. Some image making workshops were suggested but the main purpose of my visit was to be shown this long tunnel which Charlotte had a vision of being transformed into a Rainforest. My task was to paint the space and Katie was to be involved with a 3D project with groups of children to produce some large sculptures which would be installed in the corridor when the painting was completed. A collection of trees could be seen through the windows and Charlotte wanted the garden area and the feeling of outdoors to be continued into the school itself. When asked how long it would take I must have been drunk with the thought of being offered my largest painting project ever when I rashly suggested ‘about a week’. What was I thinking??!!! The corridor measured 75′ x 7′ x 7′ and I had suggested painting both walls and the ceiling. On day 3 I was accompanied in enthusiastic fashion by the assistance of children from year 6, who worked with me on a rotation basis arriving in groups of half a dozen at a time. On that day the walls changed from an ice white into a range of colours suggesting a rainforest floor. The change was immediate. 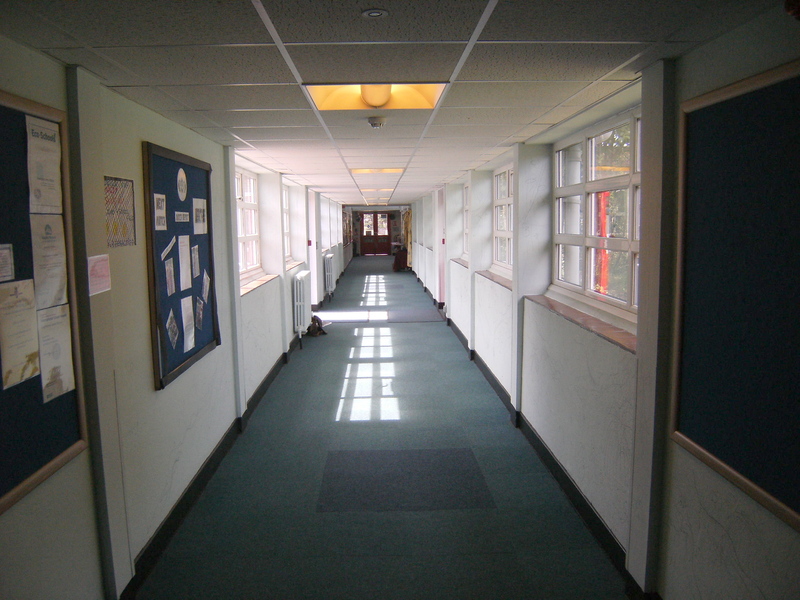 As soon as one entered the corridor the space already felt completely different. It is very difficult to describe in words but the atmosphere had altered significantly and the painting was still at a very early stage. Over the course of the next week I worked alone but the painting progressed very quickly. My approach to painting has always been to work fast in order to capture the moment and working with large mural projects is no different, and once I’m ‘in the zone’ time completely disappears as my concentration levels rise. Nevertheless, five days of painting soon passed and my ‘safety net’ day became used up too. I had a commitment to begin a project at Newark Hill Academy the next day and I wasn’t prepared to break that promise. I had to leave the corridor in an unfinished state. Frustrated and irritated, these words are much too inadequate to describe how I felt on leaving the painting incomplete – and in a public space too! The following week I returned to the corridor and with another day and a half of painting I had found a conclusion. A Rainforest has been established and with it 37 creatures to track down. From start to finish my original estimate for painting the corridor was not so far out after all, ‘about a week’ actually turned out to be eight and a half days.